In Britain their are two types of squirrel: The Red Squirrel and Grey Squirrel. The numbers of red squirrels have decreased drastically due to the introduction by humans of the grey squirrel and lack of conservation. The red squirrel is a tree squirrel in the genus Sciurus. 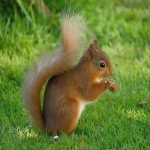 Numbers of red squirrels in Great Britain, and Ireland, have decreased drastically in recent years due to the introduction of the grey squirrel by humans and lack of conservation. The red squirrel has a typical head and body length of 19 to 23 cm (7.5 to 9 in), a tail length of 15 to 20 cm (6 to 8 in) and a total mass of 250 to 340 g (8.8 to 12.0 oz). Red squirrels eat a range of food; tree seeds, for example conifer cones which they strip to get at the seeds within. They will eat some types of fungi found in the forests as well as hazelnuts, beech and chestnuts, berries and young shoots. A scatter-hoarder; hoarding food in numerous small caches for recovery later. Some caches of food are temporary such as those made near a source of abundant food. Stored food may be retrieved within hours or days for reburial at a more secure site. More permanent, secure and food caches are left for weeks or months. Squirrels tend to make several thousand caches each during seasons. Red squirrels have a less accurate spatial memory for the locations of their caches which results in having spend a lot of time in search for them when in need of food. Their habitat is typically broad leafed woodlands and coniferous woods with although they prefer for Scots pine. Red squirrels are found in broad-leaved woods where there is a mixture of trees and shrubs but less so now due to the more competitive grey squirrels. Nests are made out of twigs and lined with moss, tree bark, leaves, and grass. Tree hollows and woodpecker holes also serve as nests. As well as a home their nests serve as protection from a variety of predators.